My Auty Gillian Twinkle Teeth used to tell me that Toadflax was a material found on amphibians and that it was used to make polyester shirts…bless her…she’ll be out of Holloway soon…that sheep was dead already. The wise folk of the Higgledy Army have decided that in 2011 our friend Toadflax will be super cool and trendy. 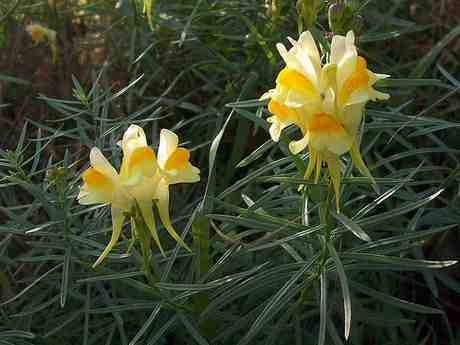 With this in mind, Linaria will be planted en mass in the joyous beds that make up the Higgledy Empire. Sowing outside. Sow from about three weeks before the last frost at two weekly intervals until the end of spring, and again in the autumn. Spacing 6 to 40 inches (15 to 100 cm). Sowing indoors early requires you to put the seeds in the fridge for a few days….a process called stratification…which is somewhat geeky and annoying so I just go for the sowing outside option. Make sure your soil is in full sun and is free draining….clay is best avoided. don’t like the idea of toadflax- spend my time pulling it up- it spreads like wildfire and is difficult to get rid of!!! Don’t Toadflax flowers smell, erm, unpleasant? Or is that just the wild variety? Once upon a time in a different life I might have been able to help but I’m pretty clueless these days, it’s all been made so easy….unless you have probelms with your ‘cookies’ it seems? However, someone esle has mentioned the problem too so I might have a delve…. Meanwhile, it’s good to know you like it, thank you!